Roadway striping is much more important than most people assume. Some Tampa residents aren’t even sure what roadway striping really means! Though one can claim roadway striping is simple yellow and white paint on the road, it is just as important as red lights, stop signs and “do not enter” signs. Roadway striping is put in place to guide, advise and warn drivers. It is important that this paint is bright, clean and easily visible for all drivers. Roads are marked for traffic progression in an organized manner. Everything from merge lanes to turn lanes, through lanes and bike lanes are marked. Striping is also necessary for crosswalks and stop locations. Pavement markings work in unison with signs to ensure traffic flows in an efficient and safe manner for drivers as well as pedestrians. Paint is typically used for pavement markings yet other materials can also suffice. As an example, thermoplastic is typically used in addition to paint. Many roads require a coat of paint during the curing process that follows construction. A final thermoplastic coat is added about a month later. White lines on the road indicate traffic moves in the direction one is traveling. As an example, white expressway lines along the pavement separate lanes. This is an indication that vehicles next to yours are traveling in the same direction. A white line that is broken indicates it can be crossed. A complete white line should not be crossed as doing so could prove dangerous. Yellow lines along the pavement indicate traffic is moving in the opposite direction. Broken yellow lines indicate passing is legal. Solid yellow lines indicate crossing should not occur. The failure to implement lasting roadway striping or refresh roadway striping in a timely manner can have disastrous consequences. Thermoplastic is plastic that is heated to a high temperature. This material arrives as a powder and is placed in melter pots for heating at 400 degrees. Once heated, the material is put in applicators and extruded with dies to form the proper width line of the marking in question. A beading system is used to add a glass bead coating to the fresh surface. Beads are embedded to form a reflective mark that allows for safe nighttime driving. It is also possible to hot spray thermoplastic yet the resulting coating is typically thinner. Similar to extruded thermoplastic, paint is applied at a wet thickness of 15 mil. This application occurs with an embedded bead coating. Roadway striping colors range from yellow to white, blue, red and even black. Some Tampa clients have requested green striping to designate spaces for electric and fuel-efficient vehicles. Our team made it happen by mixing colors to generate a lovely green. We are proud to provide paint and thermoplastic markings. Whether you are looking for roadway striping made with paint, thermoplastic or a combination of both, we will make it happen. We make use of massive melter pots for the pre-melting of the material. It is then directed to applicators containing extrusion dye. Our team uses short line and long line paint equipment. Our truck-mounted unit is capable of spraying lines upwards of three feet wide with pressurized beading. We also have short line hydraulic-based equipment that is driven with a line driver that can be attached to the rear to generate extended paint lengths. 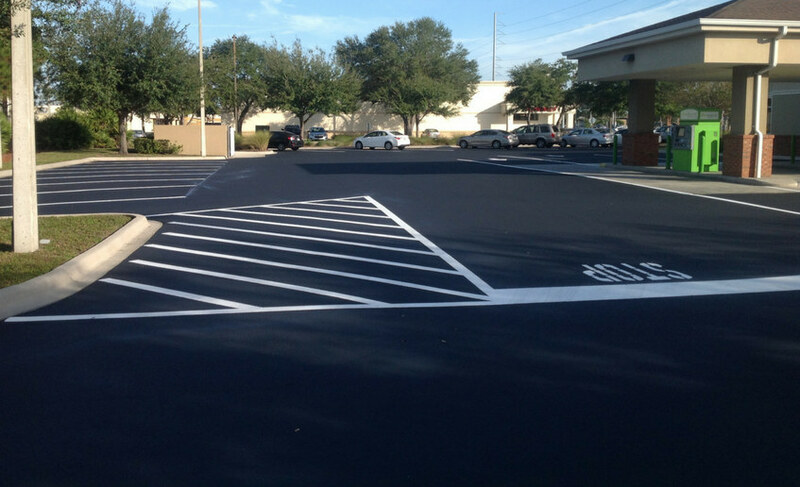 Whether you need a parking lot, road, intersection, airport or other space marked with striping, we will get the job done right.